Dorothy is shocked that her father has arrived. He promises Ryan that he has a gift for him. 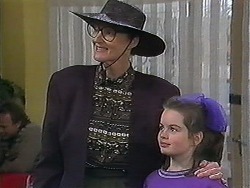 Dorothy comments that her father has not changed - when in doubt bribe the grandchildren. He is glad they are pleased to see him, to which Dorothy retorts that children can be very forgiving, considering he hasn't seen them in a year. He thinks she has loosened up a bit, especially with leaving a broken window unattended, apparently it made breaking and entering a breeze. He wants to spend some time with his grandchildren, but Tiffany is off very soon. He thinks he should stop wandering and settle down. 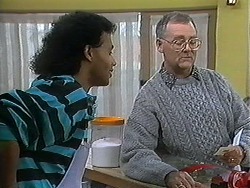 Harold is concerned that it is hot, when Eddie reminds him that wearing a woolly jumper probably has something to do with it. Harold feels silly in the new gear Madge has bought him. 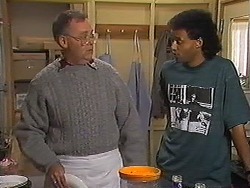 EDDIE: I must admit the shirt is a bit of a worry. If you went out like that on the street you'd qualify as a traffic hazard. Mr Clarry is regaling Ryan and Tiffany with stories of his travels but Dorothy is less than impressed. She wants to see the children's school books open. Ryan would like to follow in his grandfather's footsteps but Dorothy reminds him education is to come first. Ryan says he will finish school but the sooner it is over the better. Clarry asks if having the auntie as Principal has anything to do with it but Dorothy doesn't think it is anything worse than she can handle. Clarry then reveals that Dorothy played up a lot more than that when she was at school even putting frogs in the headmistresses lunchbox. Dorothy thinks that is enough, he is undermining her authority. 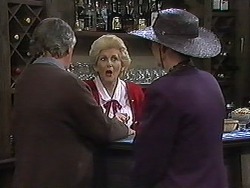 Madge enters, asking about the prowler who is introduced by Dorothy as her father. He wonders if she is an air hostess but it is confirmed she works at a bar. Cody is feeling guilty and she never even found out if she got to the semi-finals of the quiz or not. She insists that Todd tells Melissa the truth but neither of them wants to hurt her. He promises to tell her soon but Cody insists that he tells her - tomorrow. He agrees. Josh and Melissa are discussing the quiz - it is the best time they've both had in ages. They lean in to kiss. Melissa weakly utters Josh to try and stop him, so they kiss once more before stopping. Josh repeats the question in a way which makes it clear this doesn't concern Todd. They kiss again. Madge and … both think Harold looks good. Clarry pops in with a red rose, which Madge claims to be a health and safety hazard. He wins her round and she accepts it. MADGE: There really is something special about a single red rose. Clarry is discussing opals, he claims that any woman he settles down with won't want for anything. 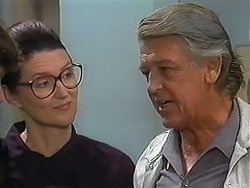 Dorothy is not amused to find Clarry there rather than with his grandchildren, after all that was his main purpose in coming to Erinsborough. Harold has received flowers but they are not signed and have a rhyme praising his new attire. …. Suggests Dorothy might have sent them but Harold thought she was just being facetious. 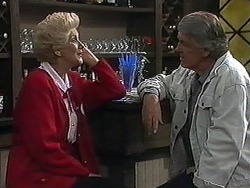 Madge has confessed to Eddie that she sent the flowers. MADGE: You look spunky in that shirt. Todd and Cody are talking, she can't handle another night like last night, where she and Todd had to pretend that they were still with Josh and Melissa. 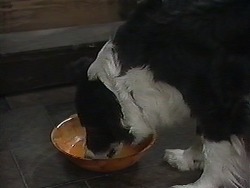 Clarry is still attempting to woo Madge - he has invited her for dinner on Friday. 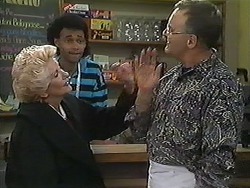 Dorothy tells him that Madge has a husband, but that does not put Clarry off. CLARRY: A husband makes things more interesting! Dorothy is appalled and attempts to dissuade Madge from coming to dinner, but both she and Harold are free and will come. Josh is talking to Melissa, he thinks that perhaps things are too hard, so they should just split up, but it is not what either of them want. They kiss just as Cody and Todd come into view from behind some bushes. TODD: (at the same time) Josh! Todd and Cody swiftly drop each other's hands.